There once was an alley in Culver City made famous as the location where two guys were caught with their pants down. If you’re reading this because Google erroneously brought you to this site, you may be intrigued by that statement. But if you’re a Laurel & Hardy fan, you know that I am referring to a scene from the film Liberty in which the boys, as escaped convicts, attempt to exchange their plain clothes for their prison uniforms. In their haste, the boys mix up the pants and wind up wearing one another’s trousers. While searching for a secluded place to exchange pants, they duck down an unassuming alleyway. Athough it was known to fans as the Liberty Alley, this location almost secured its place in history as the We Faw Down Alley. 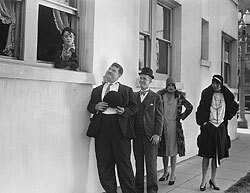 When Stan and Ollie jump out of the girls’ apartment window in We Faw Down, which pre-dated Liberty by just over one month, the script called for a sequence in which the boys find out they have mistakenly put on each other’s pants. Many of the pants gags used in Liberty were originally intended for the earlier film. Ultimately the film was too long and these scenes were scrapped. It’s entirely possible that We Faw Down originally featured a pants exchange scene of its own in this very same alleyway. The building that makes up the western side of the Liberty Alley was indeed the same building featured in We Faw Down. The boys jump out of the middle set of windows of this building, which was aptly known as the “We Faw Down Building.” On the eastern side of the We Faw Down building is where Laurel and Hardy encounter Jean Harlow in the taxi cab during an earlier scene from Liberty. All of these scenes were shot in 1928. 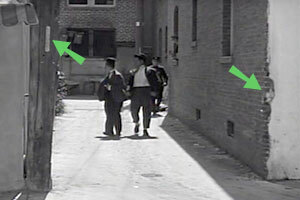 Laurel and Hardy were not the only stars of the Hal Roach Studios to feature this alleyway in one of their films. Charley Chase also appears at these two locations five years later in the film Midsummer Mush. (This is the only known instance that we get to see the Liberty building in sound!) In the opening scene, he walks past the corner where Jean Harlow appears in Liberty, walks down the street past the window Stan and Ollie jump out of in We Faw Down, then stops and waits for a car to pass at the Liberty Alley. As he obliviously marches past, viewers can note the broken plaster on the one side of the alley, while the tilted telephone pole is visible on the other side. It’s as if Charley had no idea of the historic value of these locations! 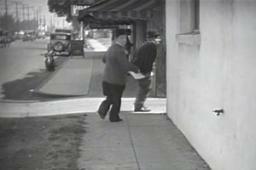 Unbeknownst to most buffs, Liberty and We Faw Down are not the only Laurel and Hardy film to feature this location. 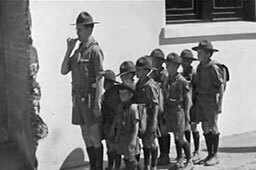 Although both Stan and Babe appear in 45 Minutes From Hollywood, it is Glenn Tryon who is the star of this film shot a full two years earlier than the boys’ encounters with this spot. Tryon is whisked past the We Faw Down Building and then down the Liberty Alley in the first reel of the film. While there are many identifying marks to verify that these locations are indeed all one and the same, the most obvious area to examine is the corner of the building on the right side of the alley with its prevalent chunks of missing plaster. On the opposite side of the alley there is a cockeyed telephone pole leaning to the right, and high up on the pole is a piece of wood that is clearly visible in all films. The Hal Roach Studios backlot contained many stores, cafes, and night clubs but apparently there were no filmable alleys. Perhaps because it was so conveniently located, the filmmakers at Roach returned to this location multiple times despite the numerous alleyways located all over downtown Culver City. Dozens of alleys run parallel on either side of Main Street and along the northwest side of Culver Boulevard. But only this alley was featured in Hal Roach films. The Liberty Alley was discovered in the 1970s during which time downtown Culver City was becoming an undesirable place to visit. Although the locals certainly stayed clear of dark alleys in this neighborhood, many fans were able to visit the location in the 1980s. During an urban renewal of the area in the early 1990s, the dilapidated buildings which formed the alleyway were torn down. Downtown Culver City has since become an attractive and safe place to be, with many shops and restaurants. Today, the exact location of the Liberty Alley resides in a parking lot across the street from the Culver Hotel. They sure liked that alley! Thank you for this article and photos. It’s always interesting to learn new tidbits of information about the Boys’ films. 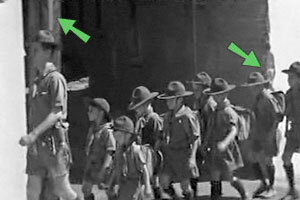 Here’s something that somebody at the Laurel and Hardy Forum website noticed. It appears that the same corner that Laurel and Hardy ran around in Duck Soup to grab that bicycle is the same corner that they ran around (the other way) in trying to escape from that goat in Angora Love, their last silent film, 2 and half years later (Duck Soup was filmed around September, 1926, and Angora Love was filmed in March, 1929). Also, there’s a railroad crossing and track that seems to run parallel with another street. Is that around the same place where they filmed the dialog in the car in Going Bye Bye? The dialogue scene in the car in “Going Bye-Bye!” was filmed in front of the Culver City City Hall (which also served as “County Hospital”). The City Hall was located further southwest down Culver Boulevard, the same street that ran in front of the “Liberty” alley. I was watching a silent Our Gang comedy titled “Official Officers” last week. There is a scene in this movie which seems to feature the ‘Liberty Alley’. You can notice the same piece of plaster missing from the bricks – and those 3 windows (the middle window located higher than the other 2) seem to match up. Could this possibly be the first time the ‘Liberty Alley’ is featured in a film? Title cards in “Official Officers” dub this alley as ‘Wildcat Alley’. There is also a very brief scene later in “Official Officers” which features a policeman standing on a street corner with a small building in the background. It appears to me that possibly this is the same location where Oliver Hardy fell into a mud hole in “Angora Love”. I’m less sure that I’m correct in this particular analysis. 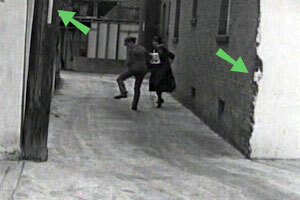 Here’s another sighting of the “Liberty” alley: It appears in Do Detectives Think? Just after Stan and Ollie take off running away from the shadow of the goat on the pile of tin cans (with that crazy shot of them running on a treadmill in front of a moving background), there’s a night time shot of Ollie alone, running down a street. He runs right by the “Liberty” alley, tripping on the sidewalk curb. Put your DVD or VCR (as the case may be) on pause, and single-frame it through that shot, and you will recognize the alley, chipped bricks and all.